Nixon Wildcard Hunter was born with odds stacked against him. The source of his medical fragility is still a mystery, but from day one – Christmas Day, 2012 – he struggled to thrive. A weak heart and a suppressed immune system had him in and out of the hospital constantly. 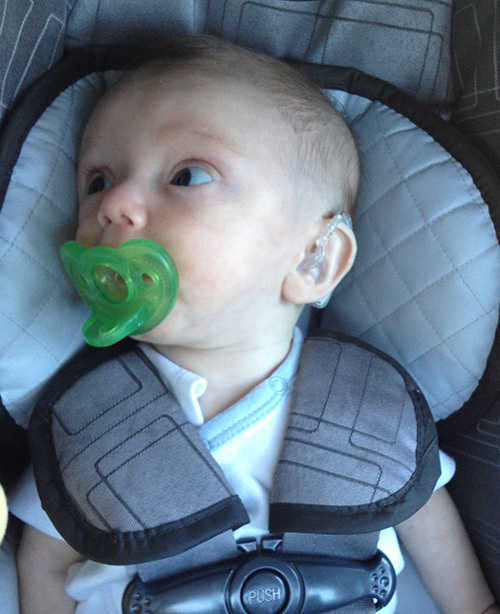 Nixon underwent multiple blood and platelet transfusions, heart surgery and a host of other procedures. Through it all, his sweet and quirky personality won him many friends and followers. One of the most troubling symptoms of Nixon’s condition was deafness, which was confirmed when Nixon was two months old. His parents, Stephanie and Rich, feared for his future in many ways, but the deafness was especially heart wrenching for them. What would life be for him? Nixon ultimately needed a Cochlear Implant, but in the meantime needed the assistance of well-fitted hearing aids. At thousands of dollars per pair, hearing aids were yet another extraordinary expense on top of the mountain of bills under which the Hunters were already buried; but without hearing, they knew that Nixon’s brain would not develop at the pace it should. Nixon’s case was brought to the attention of HearAid Foundation, an OC-based nonprofit organization with a mission to provide hearing aids to children, elderly and other members of our community who otherwise cannot afford them. Nixon was fitted for custom hearing aids to the great relief of his parents. It wasn’t long after he received his hearing aids that he was admitted to the hospital where he would face his final battle for life. His last few months were spent hearing his parents voicing their love for him. He was eight months old when he passed away in August 2013, in his daddy’s arms. One chilly morning in early December, Sonny Hong was running the hills near his home in Orange. Sonny and his wife Cheryl, an audiologist, both sit on the board of HearAid Foundation. Sonny had been a marathon runner in his younger years and had picked up running again at 48. He had casually committed to running a marathon in early 2014, but was finding that it wasn’t as easy as it once had been. He was running to get healthy and harden his body; he was running for himself. And he hit a wall. So Sonny decided in that moment to run for something other than himself – and it was Nixon’s face that rose in his mind’s eye. He had been deeply affected by Nixon’s case. He decided to run to honor Nixon’s fight, and he would run to help people hear. By the time he finished his run that morning, Sonny had decided what he was going to do: a 49-mile ultrarun, during the month of his 49th birthday, with a goal of raising $49,000. With Stephanie and Rich’s support, he is calling the run the Wildcard Ultrarun, adopting the fun-loving middle name Nixon’s parents gave to their brave boy long before they knew how brave he would have to be. Every penny Sonny raises through his run will go to HearAid Foundation and the people, especially the children, whom it benefits. 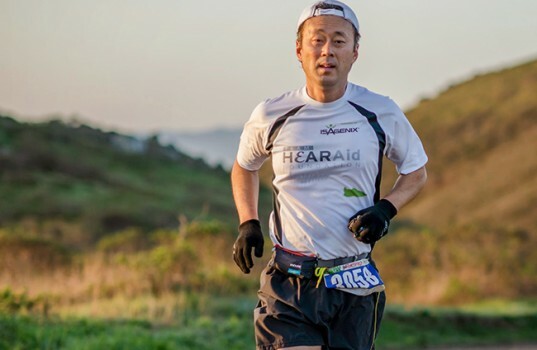 He will run on June 7th from Palos Verdes to Laguna Niguel Regional Park, each miles sponsored by corporations, such as Isagenix International, and individuals. When parents of hearing-impaired children cannot themselves afford hearing aids, public assistance can take up to six months. Six months of hearing loss during critical developmental years can dramatically affect a child’s ability to acquire speech and language skills, which can have a lifelong impact. For many children, hearing aids are sufficient to help them make all the critical connections – in their brains and in their communities. In fact, Tanya and the folks at HearAid were so inspired by Sonny’s commitment that they have planned the Wildcard 5K Family Fun Run/Walk, also benefiting HearAid and taking place on June 7th. The 5K run will be timed to begin at about the time that Sonny will be trotting into Laguna Niguel Regional Park – approximately 3:30pm. Sonny will finish the last 3.1 miles of his ultrarun surrounded by hundreds of people who will come out to support the same cause, including Rich and Stephanie Hunter’s community that have dubbed themselves the Wildcard Army. The Wildcard 5K Family Fun Run/Walk on the afternoon of June 7th is open to the public. Registration for the timed run begins at 2:30pm and the event will be full of fun, games and prizes. Find out more and register for the event by visiting hearaidfoundation.org.